Equity Derivatives Explained is written in a clear, concise and down-to-earth manner by a long time practitioner and published author, this book delivers the necessary knowledge about equity derivatives for students, traders and finance professionals. Designed to bridge the gap between theory and practice by taking a risk centric approach, focusing on the fundamentals of why equity derivatives exist, the various strategies deployed and the aspects are most important to the relevant participants. Avoiding the typical long and complex theoretical and mathematical approaches, in favor of a direct, simple and intuitive approach, this introductory text offers an applied, practical and realistic approach to understanding equity derivatives. This book provides succinct but thorough coverage of the essentials of equity derivatives. It starts with an introduction on stock markets' fundamentals before opening the gate on the world of structured products. Delta-one products and options are covered in detail, providing readers with deep understanding of the use of equity derivatives strategies. Equity Derivatives Explained contains most of the traded payoffs and structures and covers all practical aspects of pricing and hedging. For each product, payoffs are accompanied by graphs, scenario analysis and real-life examples. The treatment of risks is performed in a very intuitive fashion and provides the reader with a great overview of how dealers approach such derivatives. The author also delivers various common sensical reasons on which models to use and when. 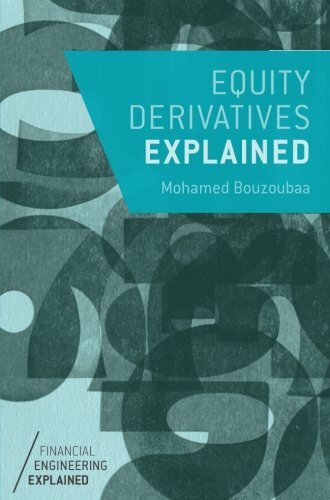 By discussing equity derivatives in a practical, non–mathematical and highly intuitive setting, this book enables practitioners to fully understand and correctly structure, price and hedge theses products effectively, and stand strong as the only book in its class to make these equity-related concepts truly accessible.